By himself, Pt. Chitresh Das is a living example that refutes the old adage that good things don't last. I have known him for at least 25 years, since the latter part of 1980's when my Guruji and I used to meet him in Calcutta, when he and we used to perform in the annual festival of Ramakrishna Mission at Golpark. Then I was struck by the boundless enthusiasm of the man, and more than 25 years later (in October 2010 in USA), I am equally impressed by the same boundless enthusiasm. What is more amazing is that his intensity is so easily infectious that it filters down to every member of his organisation - Chhandam Chitresh Das Dance Company - and I know that it takes years of effort and attention to detail in order to achieve what I can only describe as 'finesse'. From insisting that his representative receive us at the airport, to the meticulous attention paid to us right through our stay at the Traditions Engaged festival, it showed an astonishing degree of efficiency as well caring. As far as arrangements go, it is impossible to find fault with Pt. Chitresh Das's organising ability and the warm hospitality extended to artistes and accompanists. It is so good that nothing has changed in the 25 years that I have known him, but that things seem to be improving with age. In fact, age cannot wither nor custom stale, his infinite variety. As to the content of his festival, the variety was evident in the recitals and so was the quality of the performances. If I have returned from Pt. Chitresh Das's festival with a good feeling about the fare on offer, I must also emphasise that the meticulous arrangements helped in energising and enthusing the artistes invited. Very often, the solid work that goes into organising first rate festivals is not noticed by critics and reviewers. I am glad that this was brought home to me in the form of a rewarding experience that people can emulate with assured benefits. It goes to the credit of Pt. Chitresh Das that he has so eloquently and effortlessly shown the way. The festival began at Yerba Buena Center for the Arts, San Francisco. Between 1st to 3rd October 2010, there were performances by Guru Darshana Javeri (Mohiniattam), Gurus VP Dhananjayan and Shanta Dhananjayan (Bharatanatyam), Guru Ratikant Mohapatra (Odissi), Dr. Mahua Mukherjee (Gaudiya Nrutya), Sadanam Harikumaran (Kathakali), Mythili Prakash (Bharatanatyam) and Chitresh Das Dance Company represented by Charlotte Moraga, Seibi Lee, Rachna Niwas, Rina Mehta, Anjali Nath, Antara Bharadwaj, Labonee Mohanta and Kasturi Mishra. These performances were repeated between 8th to 10th October 2010 at REDCAT (Roy & Edna Disney/Cal Arts Theatre), Los Angeles, with the exception of Mythili Prakash's slot which was replaced by Pt. Bachanlal Mishra (Kathak). All these performances were undeniably excellent and only to be expected of the noted artistes involved. Personally speaking, I did feel slightly unfulfilled with Dhananjayans' choice of themes vis a vis the 'intensity' of this particular festival. No doubt their items were excellently presented, but I wished for themes with a depth and 'large canvas' sweep that choreographers of their calibre are eminently capable of producing. For me, and for a number of others, that would have been a learning experience! Mythili Prakash's interesting use of Sufi elements in her Bharatanatyam recital spoke well of the ability and desire to marry two alien flavours. While the intension is laudable, the manner in which it was executed seemed to lay more than necessary emphasis on the Kawali overtones of 'Allahu Allahu Allahu Allahu' which, in my humble opinion, gave a different slant to an otherwise polished Bharatanatyam recital. Fusion is welcome, and at the hands of Mythili Prakash, an eloquent performance it was indeed. But when "Allahu" or any such device is introduced into a festival with the title 'Traditions Engaged,' I am beset with questions of appropriateness. A significant part of the festival was the daytime panel discussions by the performing artistes themselves on the subjects 'What is a Guru' and 'Indian Classical Dance and Theatre – What's the Story'. While these deliberations were interesting and evoked a variety of responses, the time usurped by Sadanam Harikumaran was so long that it ate into the time allotted for others. But such things do happen at festivals and this single incident did not take away from the overall excellence of the organisation. There are quite a few good memories I have brought back from the festival. The immaculate danseuse Darshana Javeri, who continues to be a storehouse of unlimited energy and experience. Her advancing years have not diminished any aspect of her; in fact she seems to be getting better all the time. The other impressive personality was Dr. Mahua Mukherjee, whose considerable scholarship was visible throughout her lecture demonstration. Its excellence matched that of her performance in the Gaudiya Nritya style and offered a pleasing glimpse into this rarely performed dance tradition. Chitresh Das Company's own dance presentation titled 'Sita Haran' was a stunning performance in all aspects. The singing by Debashis Sarkar, the backdrop video projection, the choreography and costumes – all combined to create a powerful run-up to the grand climactic of the final scene. Considering it was the world premier of the National Dance Project, it served the purpose admirably. The daytime music and dance performances were also of a high order. Specially evocative among them were the performances by Shila Mehta (Kathak), Vidya Subramanian and Rasika Kumar (Bharatanatyam), and Jyoti Rout, Niharika Mohanty and Vishnu Tattwa Das (Odissi). 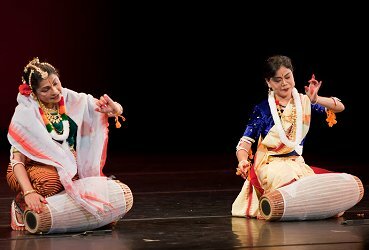 Niharika Mohanty's performance brought out her disciplined approach to classical Odissi, in her continuing journey of propagating through 'Gurushradha,' the richness of Guru Kelucharan's typical style all over North America. Niharika's faithful portrayal demonstrated the hard work she has put in over the years. The closing item in both San Francisco and Los Angeles was a solo Kathak performance by Pt. Chitresh Das himself. Apart from demonstrating the undisputed virtuosity of the dancer/choreographer, what was equally impressive was the jelling together, intensely, of Pt. Swapan Choudhury on Tabla, Pt. Bhavani Shankar on Pakhawaj and the dancer himself. Specially stunning was the pao tatkar (rhythmic footwork) sequence which created a fully lifelike representation, in marvellous sound, of a railway train leaving the platform, picking up speed, and re-entering the platform. The way the train negotiated the open spaces and then the shaded portion of the platform, all represented in brilliant footwork with a varying sequence of staccato sounds. Very memorable, and I find myself, back in India, talking about it ceaselessly to many friends. In summing up, I would like to quote Pt. Chitresh Das himself. "Dance has always been a medium for me – a medium for sharing, gaining and exchanging knowledge, a medium for personal expression, a medium for connecting with something greater than myself be that God, the Divine or the person sitting next to me." I could not have put it better.